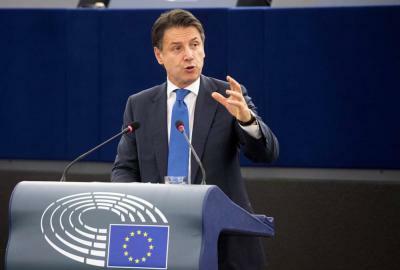 STRASBOURG – Prime Minister Giuseppe Conte has been branded a “puppet” by MEP Guy Verhofstadt in the European Parliament, drawing fierce rebuke from members of the Italian government. “I wonder how much longer you will be the puppet moved by [Matteo] Salvini and [Luigi] Di Maio,” Verhofstadt said in Strasbourg, after Conte had made a speech criticising the EU’s “unsustainable” immigration rules. “It hurts me to see the political denigration of Italy,” the MEP added, lamenting the shift in Italy’s approach to the EU since the Lega-M5S coalition was formed in June 2018. Unsurprisingly, Deputy Prime Minister Salvini was rather more confrontational in his response to Verhoftstadt. “That some European bureaucrats, accomplices to the disaster of these years, dare to insult the Italian Premier, government and people is really disgraceful,” the Interior Minister wrote on Twitter. The “senseless escalation between Italy and France” was also criticised by many in the Parliament despite Conte insisting that relations between the two countries were “solid.” President Mattarella had spoken to Emmanuel Macron, Conte confirmed on Wednesday.